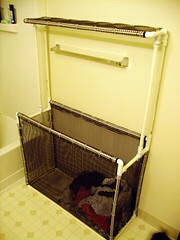 I decided to make a laundry hamper for my bathroom last weekend. For some reason I didn't want to just buy a hamper, I guess I had specific ideas about durability, shape, and size that weren't available. I also wanted a place to put my towels, and I don't think any hampers have built-in towel racks, and no towel racks have a place to put a hamper. Home Depot is within sight of my front door, so I walked over and wandered the aisles with the familar blank expression of home-improvement pondering. I walked back with 40 feet of 1/2" PVC tubing, various connectors, zip ties, and plastic garden mesh. The result in the photo took about 1-1/2 hours. Aesthetics aside, it definitely works, doesn't take up much space, will never rot or warp like my original wood construction idea, is a little bigger than expected but will be able to hold all my laundry even on a day I wash blankets. PVC tubing is only like $1.89 per 10 foot piece, so it's a cheap construction material and pretty strong in lengths shorter than 3 feet. Submitted by Garrett on Sat, 04/05/2008 - 09:29. Over at Darker Technologies they're making good progress on the Maker Faire projects that we're exhibiting in the same booth this May. The first LED grow lamp array has been built and tested. It uses red and blue LEDs, since those are the wavelengths plants absorb (they reflect green, so no need to waste power emitting that color). He'll be testing the arrays on live plants this month, using other light sources as a control. If you're in the SF Bay Area this May, stop by the Maker Faire in San Mateo and check out all the great projects and exhibits! There's a lot to do! It's fun! Submitted by Garrett on Fri, 04/04/2008 - 14:59. Just in time for April Fool's Day! I built a device that has the potential to drive a computer user insane. Submitted by Garrett on Thu, 04/03/2008 - 16:02. I like this ball throwing robot and the dog operating it. Unfortunately I can't find any build details, it looks like a lot of work was invested in the mechanism and controller. Submitted by Garrett on Mon, 03/17/2008 - 10:12. Submitted by Garrett on Sun, 03/09/2008 - 18:49. ShiftBrite is a simple device I am designing and producing. It allows easy control of a bright RGB LED. The interface is a straightforward clocked serial data line and a latch input. All signals are buffered and passed through for good performance over long cables and daisy chaining many devices. Many ShiftBrite devices can be controlled from any type of controller that supports clocked serial data output, which is practically all microcontrollers and even PC parallel port or FTDI bitbang adapters. Submitted by Garrett on Sun, 03/09/2008 - 00:50. 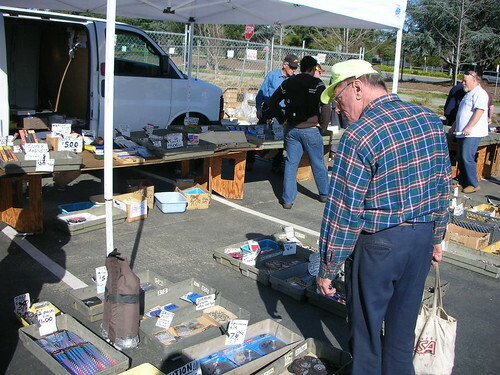 I took a trip down to De Anza College for the monthly electronics flea market. Lots of interesting parts, gizmos, tools, and random clutter. Click on the photo above to view my Flickr set of the event! Submitted by Garrett on Sat, 03/08/2008 - 20:25. Submitted by Garrett on Sat, 03/08/2008 - 02:49.